one page web site special! Established in Southern California in 1987, doing business as PCWorks, we have provided service and support to the PC industry for over 20 years. From on site computer service in your home, to web design for family and business, we offer quick response time and reliable service with very competitive rates. PCBugZero is our malicious software removal service. Malware, short for malicious software, consists of programming (code, scripts, active content, and other software) designed to disrupt or deny operation, gather information that leads to loss of privacy or exploitation, gain unauthorized access to system resources, and other abusive behavior. Preliminary results from Symantec published in 2008 suggested that "the release rate of malicious code and other unwanted programs may be exceeding that of legitimate software applications. According to F-Secure, "As much malware [was] produced in 2007 as in the previous 20 years altogether." 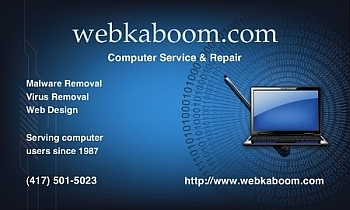 webKaboom is our web design service that gets you on the web inexpensively and fast! Web pages are rapidly becoming the international phone books of the future. Wouldn't it be nice to be able to find phone numbers, locations, and services just by typing "www.abc123.com" rather than by letting your fingers do the walking through the yellow pages? I mean let's face it, we're on the net anyway, right? And all at a cost that is a fraction of small display ads in your local phone book.